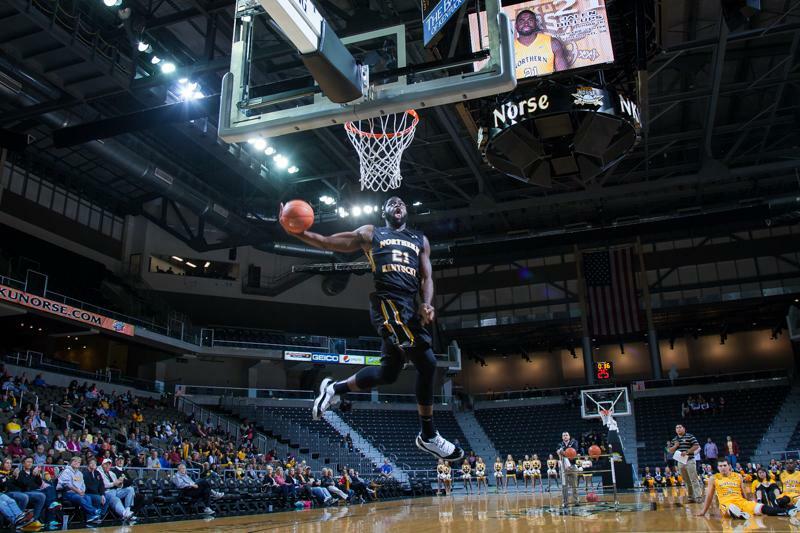 NKU men's basketball player Jalen Billups goes up for the dunk, finishing 4th in the NKU Dunk Contest at Black and Gold Madness. NKU's 2014 Black and Gold Madness was held at the Bank of Kentucky Center on October 9, 2014 celebrating the start of the 2014-15 season. 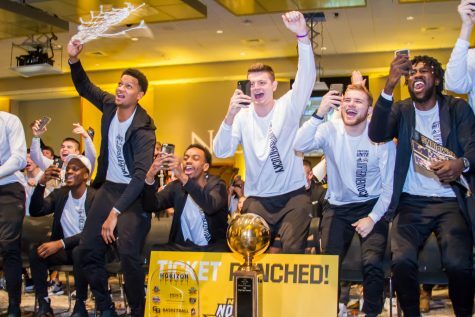 The NKU men’s and women’s basketball teams kicked off their 2014-15 campaigns by hosting their annual Black n Gold Madness for students, staff and fans at the Bank of Kentucky Center on Thursday night. 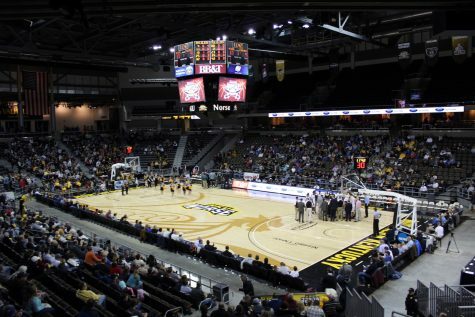 The event, in reference to NKU’s unofficial school colors, included a scrimmage, a 3-point contest, a slam dunk contest and performances by the NKU Cheerleaders and Dance Teams. Players and coaches agree that the event was important for the community and for the teams as well. Men’s basketball Head Coach Dave Bezold agreed, saying that Black N’ Gold Madness is great for the fans and the team. “For our guys, it’s great to get out and have people watch them,” Bezold said. NKU women’s basketball player Christine Roush (left) goes up for the layup against Kasey Uetrecht (23) during the scrimmage at Black and Gold Madness. NKU’s 2014 Black and Gold Madness was held at the Bank of Kentucky Center on October 9, 2014 celebrating the start of the 2014-15 season. 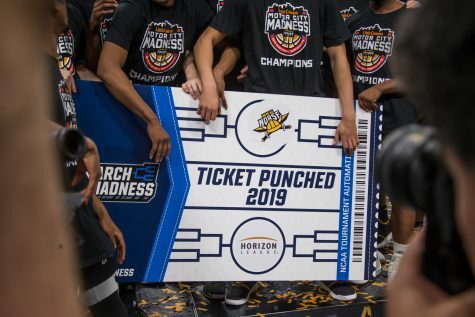 Many universities, including the University of Cincinnati and the University of Kentucky, hold a version of Black N Gold Madness, though it is typically held at midnight, calling it Midnight Madness. 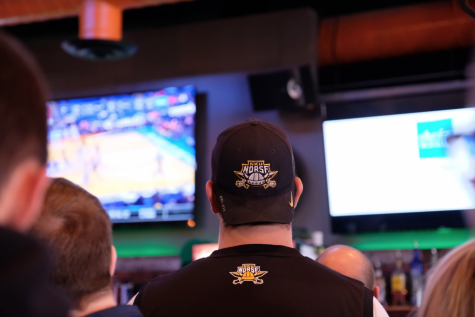 NKU’s event started at 7 p.m. in order to be more fan-friendly, according to Bezold. “We wanted to be fan-friendly for young kids and families,” Bezold said. 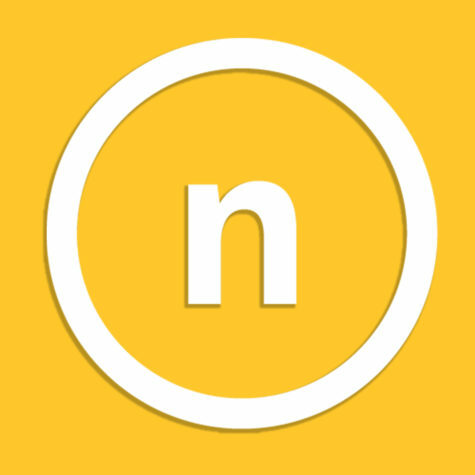 The event began with Norse Feud, consisting of a black and gold team, in the style of the popular game show Family Feud. 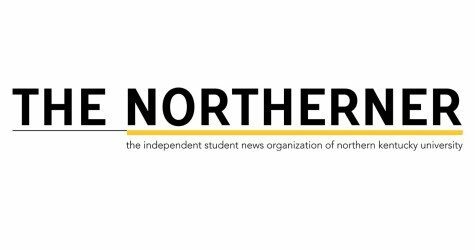 The gold team consisted of coaches from both the men’s and women’s teams, Victor E. Viking, and Norse Force member Rob Sardoni, while the black team consisted of many of the young players from each team. The event continued with a scrimmage. 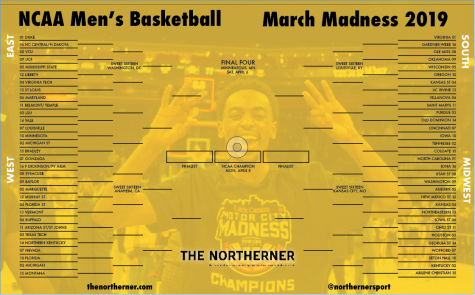 The men’s and women’s basketball teams were split up and divided into two teams, creating a black team and a gold team. After playing two halves, the Black team defeated the Gold team 36-30. A center from the women’s basketball team, senior Kaitlyn Gerrety, took home MVP honors from the game. 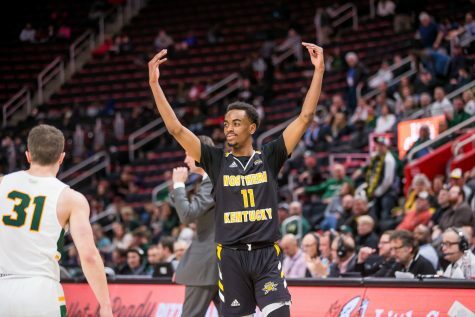 The 3-point competition followed a performance by the NKU Cheerleaders and Dance Team, with players from both teams competing against each other to determine the best 3-point shooter. 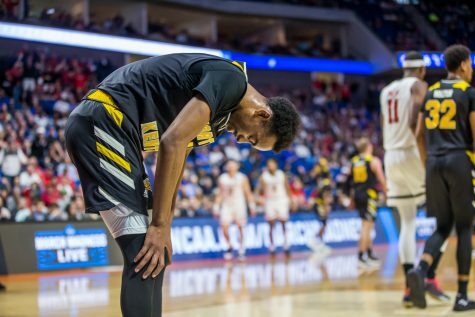 Last season, Danos was 19-39 from behind the 3-point line, finishing second in 3-point field goal percentage at 49 percent, according to NKUNorse.com. The final event of the night was a slam dunk contest, featuring four members of the men’s basketball team: Jordan Jackson, Daniel Camps, Jordan Garnett and Jalen Billups. In the finals, Camps jumped over teammate Todd Johnson to garner 29 out of 30 points from the judges to take home the dunk competition winner honors. After Bezold addressed the crowd one final time, the event wrapped up with players and coaches signing autographs. 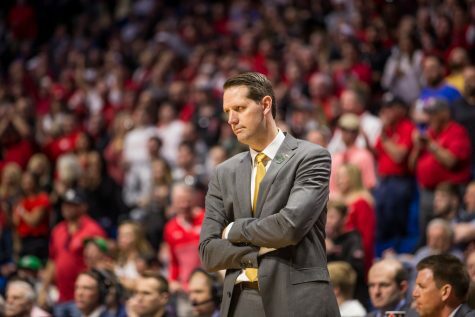 With Black N Gold madness over, Bezold said his team is excited for the upcoming season. 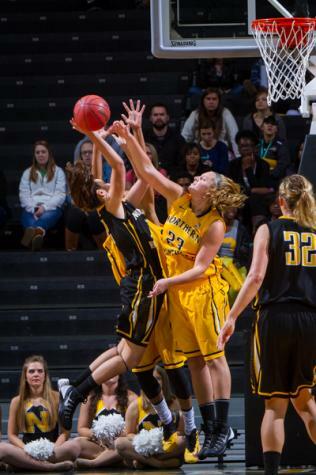 “Our biggest goal is to bring home an Atlantic Sun championship,” Bezold said. 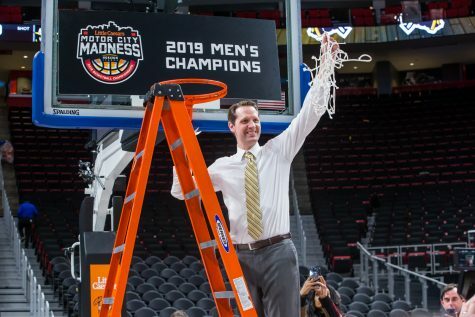 This season, NKU will be eligible to compete for conference championships, the first time since transitioning to Division I.